There are two things sure to get me in the holiday spirit: music and decorations!! 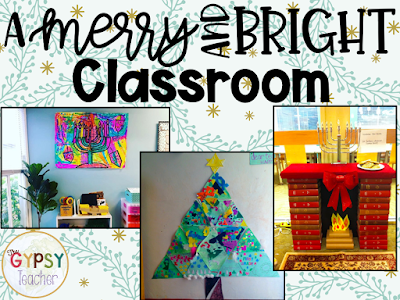 Today I'm going to share with you some tips, inspiration, and ideas to decorate your classroom for the holidays! PLEASE excuse the picture...this was my first year of teaching and first year of blogging. But I do LOVE this idea! You can click the pic to go back to my blog post for more ideas, or click HERE for the original tree idea. Basically, you give each student a green triangle or, if you're like me and don't have green paper, give them white triangles to paint first! Also, before you begin, you will want to make sure all of the triangles work together to make a tree, like seen here. 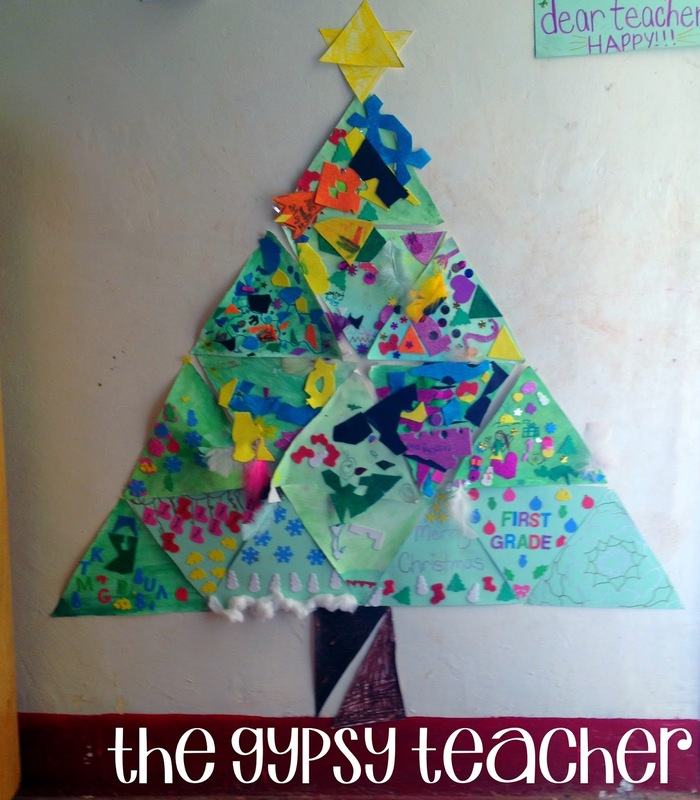 I had some students make two triangles, so that we would make a full tree! Then, everyone gets to decorate their triangle(s) however they'd like! You can set out all kinds of materials, or specific ones you'd like them to use. 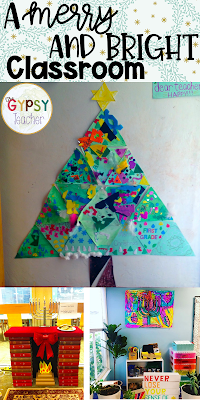 Once the triangles are finished and dry, put them up on the wall, and add a tree trunk and a star on top! I love this because it doesn't take up space, but shows that when we all work together we can make something beautiful! This activity works great for any holiday, and you could use any color papers! Click the pic to go to Amber's blog post. I love this because not only are the students making a fun decoration for our classroom, but they're also focusing on kindness! This original idea comes from Friends Art Lab on Instagram, but I found out about it through Katy at PreK Wolf Pack on IG. Katy's IG is #GOALS. She has AMAZING ideas for her PreK friends! She creates themed coloring pages on butcher paper for her class to collaboratively color together during morning centers. You can see her Hanukkah-themed page above. You could use this for any holiday you're celebrating - perfect for centers or even your holiday party! I love how beautiful these stained glass-looking silhouettes look! I think they would brighten up any gloomy looking day! Tina has free templates on her blog (click the pic to go to the blog post) or you could make your own for any holiday you'd like! So much fun!! 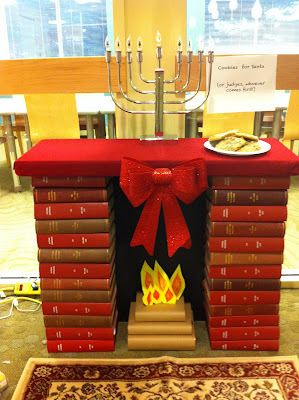 I'm loving this book fireplace from The Sassy Librarian! You could also make a fireplace out of butcher paper for the wall. But I think it cozies up your space and is a fun place for your students to sit by and read during the holidays! I love adding white Christmas lights around the room too, as it adds a beautiful glow to the scene. 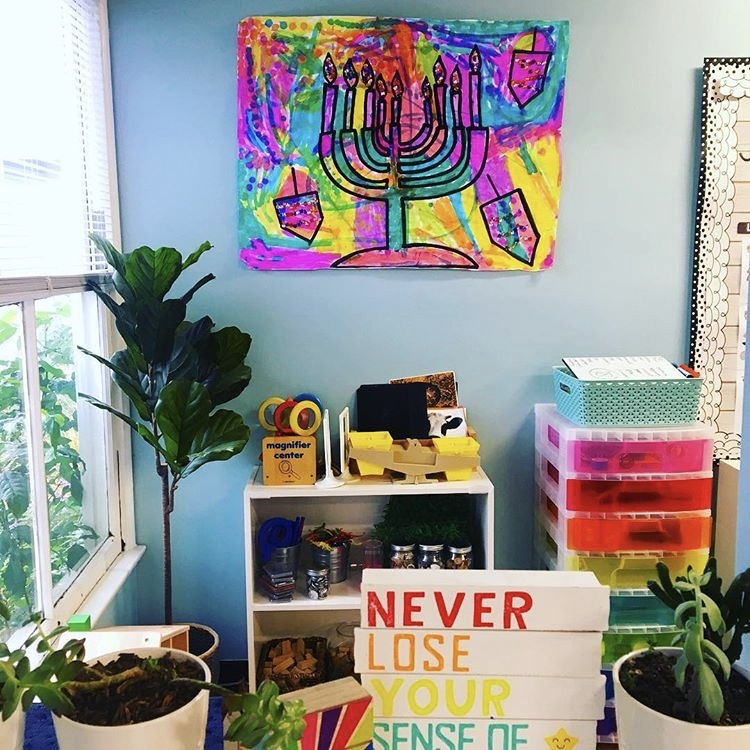 Maddie (@fairchildin5th) did this in her fifth grade classroom, and just look at how beautiful it looks!! I hope this gave you some ideas to deck your hallways and classrooms with fun decorations for the holidays!! I love having these projects ready for my students to do as early finisher activities during the first weeks of December to do something that adds more merriness to our room! If you don't know, I'm sharing all things Merry and Bright each weekday between now and Dec. 21! You can see yesterday's post by clicking HERE!